Chelsea have played their football at Stamford Bridge since 1905, football though isnt the only sport to have been staged there, in fact Chelsea "football" ground has played host to speedway, greyhound racing, American football, cricket and even a midget car racing meeting in 1948. 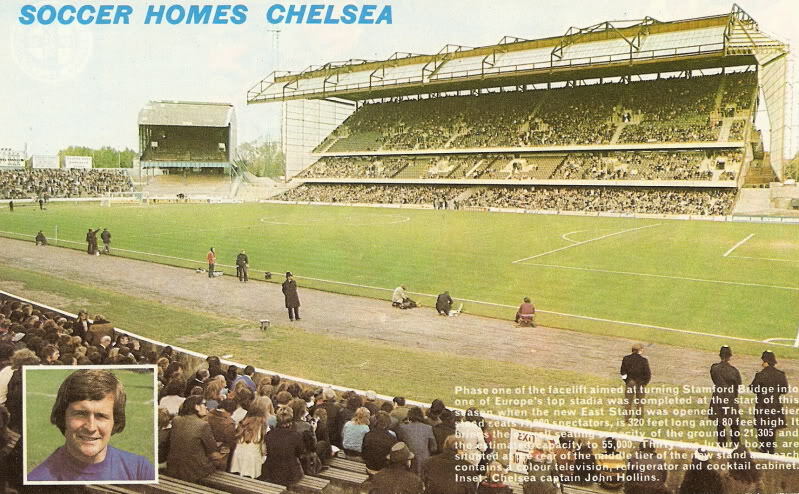 The picture below is taken from a Football Review magazine in the early 70’s, it shows the massive East Stand which very nearly bankrupted the club, who would have thought how things were to change in the prevailing 40 odd years !! "Phase one of the facelift aimed at turning Stamford Bridge into one of Europes top stadia was completed at the start of this season when the new East Stand was opened. The three tier stand seats 11,980 spectators, is 320 feet long and 80 feet high. It brings the overall seating capacity of the ground to 21,305 and the estimated capactity to 55,000. Thirty two luxury boxes are situated at the rear of the middle tier of the new stand and each contains a colour television, refridgerator and cocktail cabinet. Inset: Chelsea captain John Hollins." I have also found an absolutely stunning piece of old film footage on Google that shows the old Stamford Bridge ground as it used to be in the 1970s.